Sometimes you need info on a specific model of computer when you’re nowhere near a computer. You could scour the Web for the information, but good as the iPhone's Web browser is, it can still be pretty time consuming to track down a certain tidbit. Frankly, you could probably download and install Ian Page’s free Mactracker (iTunes link) in less time. 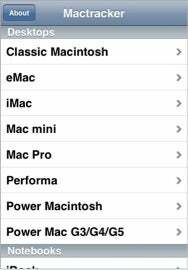 Page has long maintained a Mac version of Mactracker, compiling specs and history on all of Apple’s computers, as well as other peripherals like the iPod, the Apple TV, and even the Newton. The iPhone version of the application brings all this information to your fingertips, conveniently sorted by product line. Tap any model to get information on when the computer was introduced, its model number, initial price, complete system specs, and more. Granted, Mactracker may not be the kind of app you need everyday (well, unless, of course, you maintain an extensive collection of vintage Macs), but since it’s free and only a mere 3.4MB, there’s little reason not to indulge yourself, if only for the ability to settle that bar bet between you and your buddy over the clock speed of Apple's first PowerPC machine. What, you don't have bets over that? Then you, my friend, are going to the wrong bars. Or you have the wrong friends. Or both. (Oh, and 60MHz, if you’re curious).